Name Variation Willy Frederick Scheel was also known as W. Frederick. Name Variation Willy Frederick Scheel was also known as William. Willy Frederick Scheel was born on 10 October 1889 at Holstein, Germany. He was the son of Hans F. Scheel and Johanna (?). Willy Frederick Scheel married Elisabeth Charlotte Winter, daughter of John Ludwig Winter and Josephine Mollet, on 4 November 1913. Willy Frederick Scheel died in January 1974 at age 84. [S245] U.S. Federal Census 1900 U.S. Federal Census, by Ancestry.com, ED349. Dwelling 362. [S244] U.S. Federal Census 1910 U.S. Federal Census, by Ancestry.com, ED449. Dwelling 42. [S243] U.S. Federal Census 1920 U.S. Federal Census, by Ancestry.com, ED78. Dwelling 202. [S250] U.S. Federal Census 1930 U.S. Federal Census, by Ancestry.com, ED22-13. Dwelling 392. Mabel Shirley Scheel was born on 26 February 1917 at Minnesota. She was the daughter of Willy Frederick Scheel and Elisabeth Charlotte Winter. Name Variation Caspar Von Ballmoos was also known as Casper. Name Variation Caspar Von Ballmoos was also known as Von Balmoos. Name Variation Caspar Von Ballmoos was also known as Kaspar. Caspar Von Ballmoos was born on 17 January 1734 at Heimiswil, Gern, Switzerland. He was the son of Peter Von Ballmoos and Elisabeth Lüdi. Caspar Von Ballmoos married Barbara Schürch, daughter of Benedict Schürch and Anna Lüdi, on 19 February 1767. Caspar Von Ballmoos died on 11 October 1823 at age 89. Name Variation Barbara Schürch was also known as Schurch. Married Name 19 February 1767 As of 19 February 1767,her married name was Von Balmoos. Married Name 19 February 1767 As of 19 February 1767,her married name was Von Ballmoos. Barbara Schürch was born on 13 March 1746 at Heimiswil, Gern, Switzerland. She was the daughter of Benedict Schürch and Anna Lüdi. Barbara Schürch married Caspar Von Ballmoos, son of Peter Von Ballmoos and Elisabeth Lüdi, on 19 February 1767. Name Variation Peter Von Ballmoos was also known as Von Balmoos. Peter Von Ballmoos was born on 17 June 1703 at Oberburg, Bern, Switzerland, also reported as Heimiswil, Bern, Switzerland. He was the son of Casper Von Ballmoos and Anna Iseli. Peter Von Ballmoos married Elisabeth Lüdi, daughter of Caspar Lüdi and Anna Tanner, on 22 June 1730 at Heimiswil, Bern, Switzerland. Name Variation Elisabeth Lüdi was also known as Luede. Married Name 22 June 1730 As of 22 June 1730,her married name was Von Balmoos. Married Name 22 June 1730 As of 22 June 1730,her married name was Von Ballmoos. Elisabeth Lüdi was born on 5 January 1704 at Heimiswil, Bern, Switzerland. She was the daughter of Caspar Lüdi and Anna Tanner. Elisabeth Lüdi married Peter Von Ballmoos, son of Casper Von Ballmoos and Anna Iseli, on 22 June 1730 at Heimiswil, Bern, Switzerland. Elisabeth Lüdi died on 17 May 1771 at Heimiswil, Bern, Switzerland, at age 67. Name Variation Benedict Schürch was also known as Schurch. Benedict Schürch was born on 7 June 1705 at Heimiswil, Bern, Switzerland. He was the son of Benedict Schürch and Christina Widmer. Benedict Schürch married Anna Lüdi, daughter of Andreas Lüdi and Anna Burkhalter, on 2 May 1728 at Heimiswil, Bern, Switzerland. Name Variation Anna Lüdi was also known as Luedi. Married Name 2 May 1728 As of 2 May 1728,her married name was Schürch. Married Name 2 May 1728 As of 2 May 1728,her married name was Schurch. Anna Lüdi was born at Heimiswil, Bern, Switzerland. She was the daughter of Andreas Lüdi and Anna Burkhalter. Anna Lüdi married Benedict Schürch, son of Benedict Schürch and Christina Widmer, on 2 May 1728 at Heimiswil, Bern, Switzerland. Anna Lüdi died on 20 November 1781 at Seeberg, Bern, Switzerland. Name Variation Casper Von Ballmoos was also known as Von Balmoos. Casper Von Ballmoos was born on 29 May 1674 at Oberburg, Bern, Switzerland, also reported as Heimiswil, Bern, Switzerland. He was the son of Peter Von Ballmoos and Anna Widmer. Casper Von Ballmoos married Anna Iseli, daughter of Hans Jacob Iseli and Verena Kohler, on 25 October 1695 at Heimiswil, Bern, Switzerland. Married Name 25 October 1695 As of 25 October 1695,her married name was Von Ballmoos. Married Name 25 October 1695 As of 25 October 1695,her married name was Von Balmoos. Anna Iseli was born on 1 January 1680 at Lützelflüh, Bern, Switzerland, also reported as Heimiswil, Bern, Switzerland. She was the daughter of Hans Jacob Iseli and Verena Kohler. Anna Iseli married Casper Von Ballmoos, son of Peter Von Ballmoos and Anna Widmer, on 25 October 1695 at Heimiswil, Bern, Switzerland. Benedict Schürch was born on 31 May 1678 at Oberburg, Bern, Switzerland. He married Christina Widmer on 24 May 1700 at Oberburg, Bern, Switzerland. Married Name 24 May 1700 As of 24 May 1700,her married name was Schürch. Married Name 24 May 1700 As of 24 May 1700,her married name was Schurch. Christina Widmer was born on 20 November 1674 at Heimiswil, Bern, Switzerland. She married Benedict Schürch on 24 May 1700 at Oberburg, Bern, Switzerland. Name Variation George Karol Lykken was also known as George Karel. George Karol Lykken was born on 8 October 1918 at Sioux City, Woodbury, Iowa, also reported as Union County, South Dakota. He was the son of Sigvold Olsen Lykken and Betsy Larson. He was buried after 26 December 1988 at Roseni Cemetery, Union, South Dakota. 1925 State Census, South Dakota George Karol Lykken appeared on the census of 1925 in the household of Sigvold Olsen Lykken and Betsy Larson at State Census, South Dakota. 1935 State Census, Big Springs ward 19, Union, South Dakota George Karol Lykken appeared on the census of 1935 in the household of Betsy Larson and Sigvold Olsen Lykken at State Census, Big Springs ward 19, Union, South Dakota. 1945 State Census, Big Springs Township, Union, South Dakota George Karol Lykken appeared on the census of 1945 at State Census, Big Springs Township, Union, South Dakota. George Karol Lykken obtained US Social Security Card at South Dakota; Last residence Sedona, Coconino, Arizona. On 25 June 1967 at Larson family reunion picnic, Mitchell, South Dakota. [S184] Beresford Republic Newspaper, Vol. 96, 1989, Jan 5. [S250] U.S. Federal Census 1930 U.S. Federal Census, by Ancestry.com, ED64-5. Dwelling 85. Name Variation Selma Josephine Lykken was also known as Salma. Married Name 16 February 1958 As of 16 February 1958,her married name was Westin. Selma Josephine Lykken was born on 12 December 1912 at Alcester, Union, South Dakota. She was the daughter of Sigvold Olsen Lykken and Betsy Larson. Selma Josephine Lykken was baptized on 12 January 1913 at Rosine Norsk Evangelisk Luthersk Menigheg (Roseni Lutheran Congregation), Beresford, Union, South Dakota. She married Henning Emanuel Westin, son of Hans Westin and Anna Olson, on 16 February 1958. Selma Josephine Lykken died on 14 February 2009 at age 96 Funeral services for Selma Westin will be at 10:00 a.m. Wednesday, Feb. 18th at Peace Lutheran Church in Alcester. Visitation will be from 2:00-8:00 p.m. Tuesday at Wass Funeral Home in Alcester with a prayer service at 7:00 p.m. and the family present from 7:00-8:00 p.m. Selma was born December 12, 1912 in Union County, South Dakota to Sigvald and Betsy (Larson) Lykken. 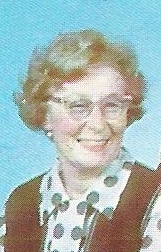 She died February 14, 2009 at Morningside Care Center in Alcester at the age of 96 years, two months and two days. Selma was baptized and confirmed at Roseni Lutheran Church. She attended Prospect Hill School and Alcester High School. Following her graduation from Sioux City Academy of Beauty Culture in 1940 she worked in Sioux City. During WWII Selma returned to the Alcester area to help her family and she worked for several families in Alcester. 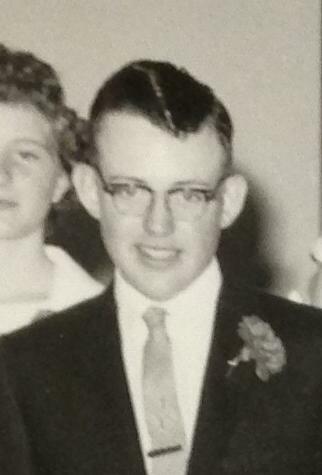 Selma married H. Henning Westin February 16, 1958 at Peace Lutheran Church in Alcester. She worked with Henning at Westin Radio and TV Service in Alcester for many years. She and Henning liked to travel and visit family and friends. Selma entered Morningside Manor in Feb. 2003. Henning died Aug. 2003. Her parents; husband; two brothers, O´Neal and George and five sisters, Alice, Ella, Bertha, Mary and Ruth preceded her in death. Survivors include her sister-in-law, Barbara Lykken of Alcester, nieces and nephews, great-nieces and nephews and great-great-nieces and nephews. Published on February 17, 2009. She was buried after 14 February 2009 at Pleasant Hill Cemetery, Alcester, Union, South Dakota. 1915 South Dakota State Census, South Dakota Selma Josephine Lykken appeared on the census of 1915 in the household of Sigvold Olsen Lykken at South Dakota State Census, South Dakota. 1925 State Census, South Dakota Selma Josephine Lykken appeared on the census of 1925 in the household of Sigvold Olsen Lykken and Betsy Larson at State Census, South Dakota. 1935 State Census, Big Springs ward 19, Union, South Dakota Selma Josephine Lykken appeared on the census of 1935 in the household of Betsy Larson and Sigvold Olsen Lykken at State Census, Big Springs ward 19, Union, South Dakota. 1945 State Census, Big Springs, Union, South Dakota Selma Josephine Lykken appeared on the census of 1945 at State Census, Big Springs, Union, South Dakota. Selma Josephine Lykken had zero children. Name Variation Lydia Mary Lykken was also known as Mary. Name Variation Lydia Mary Lykken was also known as Marie. Name Variation Lydia Mary Lykken was also known as Lydia Marie. Lydia Mary Lykken was born on 28 November 1914 at Alcester, Union, South Dakota, also reported as 29 Nov 1914. Lydia Mary Lykken was christened on 3 January 1915 at Rosine Norsk Evangelisk Luthersk Menigheg (Roseni Lutheran Congregation), Beresford, Union, South Dakota. She died on 30 August 1939 at Roseni, Union, South Dakota, at age 24 During her last three and a half weeks, Mary suffered a serious illness and suffered from pneumonia during her last week of life. Her sister, Mrs. Evjen, took care of her during this time. Mary rapidly lost strength as a result of the pneumonia. 1915 South Dakota State Census, South Dakota Lydia Mary Lykken appeared on the census of 1915 in the household of Sigvold Olsen Lykken at South Dakota State Census, South Dakota. 1935 State Census, Big Springs ward 19, Union, South Dakota Lydia Mary Lykken appeared on the census of 1935 in the household of Betsy Larson and Sigvold Olsen Lykken at State Census, Big Springs ward 19, Union, South Dakota. Name Variation Gurine Larsdatter Vevig was also known as Wevick. Name Variation Gurine Larsdatter Vevig was also known as Trina. Name Variation Gurine Larsdatter Vevig was also known as Gurina. Married Name circa 1876 As of circa 1876,her married name was Larson. She was the daughter of Lars Olsen and Jodda Larsdatter. She married Ole Larson, son of Lars Olsen Lykken and Berit Johnsdatter Stene, circa 1876. Gurine Larsdatter Vevig died on 17 March 1933 at Charles Mix, South Dakota, at age 81 first name listed as Gurnia. She was buried after 17 March 1933 at Bloomington Church Cemetery, Platte, Charles Mix, South Dakota. Gurine Larsdatter Vevig was confirmed on 20 October 1867 at Byneset parish, Norway, birthplace: Vevik.10 She immigrated in 1875 to Byneset Norway to, USA.11 She had 9 with 9 living in 1900 children. She had 9 with 8 living in 1910 children. [S9] South Dakota, South Dakota Birth Records South Dakota, State File Number: 664832 (unknown file date). 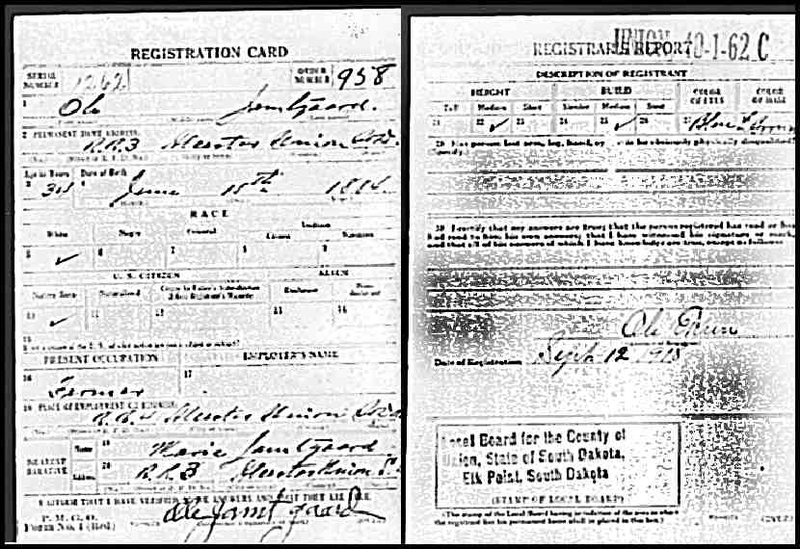 [S9] South Dakota, South Dakota Birth Records South Dakota, State File Number: 621262 (unknown file date). [S246] U.S. Federal Census 1880 U.S. Federal Census, by Ancestry.com, NA Film Number T9-0115 Page Number 449C. [S245] U.S. Federal Census 1900 U.S. Federal Census, by Ancestry.com, ED71. Dwelling 149. [S244] U.S. Federal Census 1910 U.S. Federal Census, by Ancestry.com, ED86. Dwelling 3. Sheet 1A. [S243] U.S. Federal Census 1920 U.S. Federal Census, by Ancestry.com, ED49. Dwelling 163. [S250] U.S. Federal Census 1930 U.S. Federal Census, by Ancestry.com, ED22. Dwelling 80. Married Name 24 July 1936 As of 24 July 1936,her married name was Abraham. Married Name 24 July 1936 As of 24 July 1936,her married name was Abrahamson. Vivian Florence Tepoel was born on 27 August 1915 at Sioux City, Woodbury, Iowa. She was the daughter of Albert John Tepoel and Frances Florence Kutil. 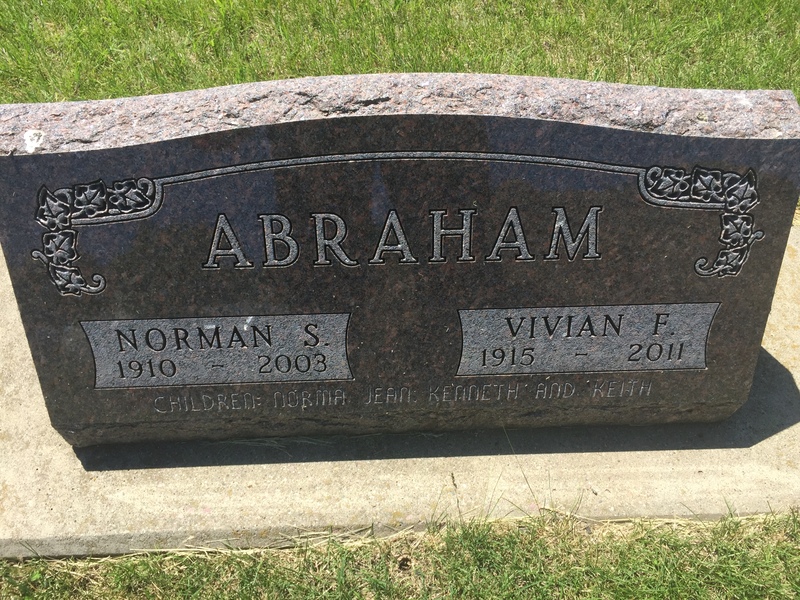 Vivian Florence Tepoel married Norman Selmer Abraham, son of Andreas 'Andy' Abrahamson and Leise Oline Larson, on 24 July 1936 at Blair, Nebraska. Vivian Florence Tepoel was baptized on 19 December 1937 at Brule Creek Lutheran Church, Union, South Dakota, listed as Mrs Vivian Florence Abrahamson. 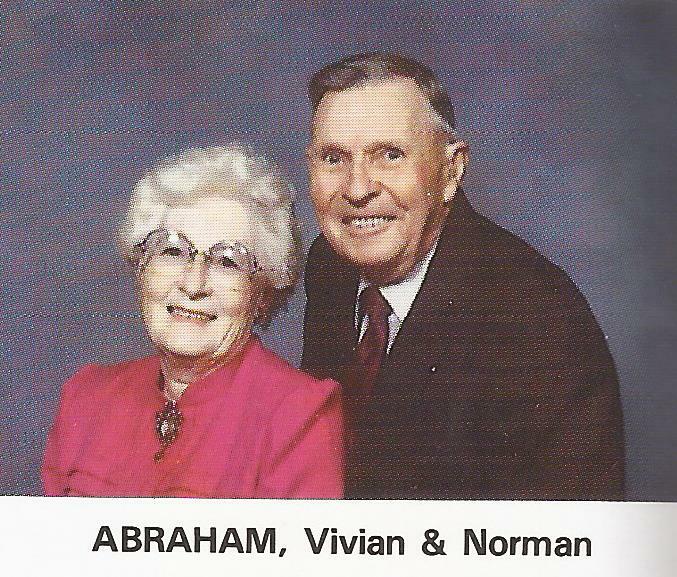 She died on 31 October 2011 at age 96 Vivian F. Abraham passed away on October 31, 2011 at Bethesda Nursing Home in Beresford, SD. 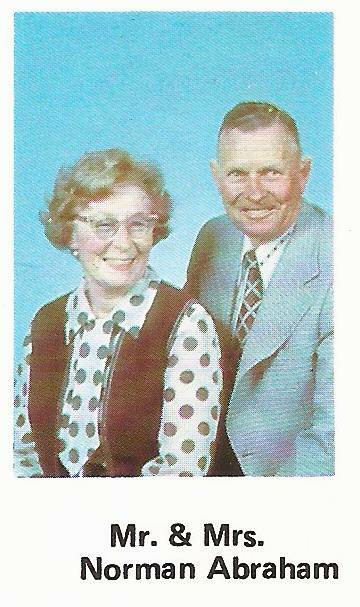 Services will be held Thursday, November 3 at 10:30 a.m. at Brule Creek Lutheran Church, Rural Elk Point, Visitation will be from 6PM to 7PM at Wass Funeral Home in Beresford with a prayer service at 7 p.m. She was born August 27, 1915 to Albert J. and Frances (Kutil) TePoel in Sioux City, Iowa. She graduated from Central HS and received a teaching certificate from Wayne State Teachers College in Nebraska. Her teaching career included country schools in the Merrill, IA area and Union County, SD; also at elementary schools in Elk Point, SD and Sioux City, IA. During her teaching career she received her Bachelors and Masters Degrees from the University of SD. She was married to Norman S. Abraham on July 24, 1936 in Blaire, NE. They made their home in Spink, SD. They were parents of Kenneth, Keith and Norma Jean. Grateful for sharing her life are her daughter and son-in-law Norma and Lowell Wetrosky, of Brandon, SD; son Kenneth and daughter-in-law Diane of Claremore, OK, daughter-in-law Diane Abraham of Elk Point, SD; 11 grandchildren: Steve (Barb) Wetrosky, Deanna (John) Uphoff, Todd (Amanda) Wetrosky, Eric (Mitzi) Abraham, Lisa (Keith) Hemmingson, Monica (Brad) Sowells, Angela (Kevin) Ford, Dana (Jason) Boke, Brad Abraham, Tim Abraham, Darin (Amanda) Abraham, 20 great-grandchildren, 1 great, great-grandchild; sister-in-law Dorothy Robinson, Elk Point, and 8 nieces and nephews. She was preceded in death by her parents, husband Norman (2003), son Keith (2008), a granddaughter Sheila Wetrosky (1976), and her brother and sister-in-law, Clarence TePoel (1987) and Arline TePoel (2011). She was buried in November 2011 at Brule Creek Cemetery, Spink, Union, South Dakota. 1945 South Dakota State Census, Spink, Union, South Dakota Vivian Florence Tepoel appeared on the census of 1945 at South Dakota State Census, Spink, Union, South Dakota. Vivian Florence Tepoel was a teacher. 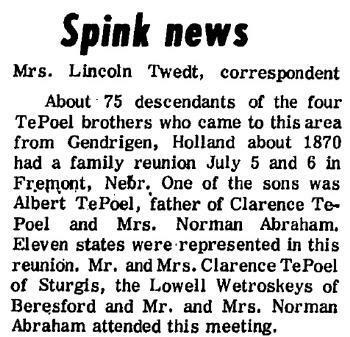 In July 1975 at Fremont, Nebraska, TePoel family reunion. She and Norman Selmer Abraham lived in 1990 at Rt. 2 Box 71, Elk Point, South Dakota. [S243] U.S. Federal Census 1920 U.S. Federal Census, by Ancestry.com, ED200. Dwelling 42. [S250] U.S. Federal Census 1930 U.S. Federal Census, by Ancestry.com, ED97-34. Dwelling 393. Keith Gordon Abraham was born on 11 January 1950 at Akron, Plymouth, Iowa. He was the son of Norman Selmer Abraham and Vivian Florence Tepoel. Keith Gordon Abraham died on 1 May 2008 at South Dakota at age 58 Keith G. Abraham, 58, of Elk Point died Thursday, May 1, 2008 at Avera McKennan Hospital in Sioux Falls, S.D. Funeral services will be 10:30 a.m., Monday at Immanuel Lutheran Church, Elk Point with Rev. Jared Rakness officiating. Burial will be in Elk Point Cemetery. Visitation will be from 5 to 7 p.m., Sunday at Anderson-Siecke-Kober Funeral Home of Elk Point. Keith was born January 11, 1950 in Akron, Iowa, the son of Norman Selmer and Vivian (TePoel) Abraham. He graduated from Elk Point High School in 1968. He married Diane Ferdig on August 30, 1969 in Elk Point. Keith worked at Load King for 20 years in Elk Point. He also worked in sales in Elk Point. Keith was very involved in the country club and was a founding member/officer of C.L.O.W.N.S. He was a member of Immanuel Lutheran Church, Elk Point. He loved golfing, fishing, hunting, snowmobiling in mountains, riding motorcycles and spending time with his friends he loved. Survivors include his wife, Diane of Elk Point; a daughter and son-in-law, Dana (Jason) Boke of Spearfish, S.D., three sons, Brad and Timothy Abraham both of Elk Point, and a son & daughter-in-law, Darin (Amanda) Abraham of Elk Point; five grandchildren; his mother, Vivian Abraham of Elk Point; a sister and brother-in-law, Norma Jean (Lowell) Wetrosky of Brandon Valley, S.D; and a brother and sister-in-law, Kenneth (Diane) Abraham of Claremore, Okla. He was preceded in death by his father, Norman Selmer Abraham. Visitation: 5 to 7 p.m., Sunday, May 4, 2008 at Anderson-Siecke-Kober Funeral Home, Elk Point. Service: 10:30 a.m., Monday, May 5, 2008 at Immanuel Lutheran Church, Elk Point. Cemetery: Elk Point Cemetery, Elk Point. He was buried after 1 May 2008 at Elk Point Cemetery, Elk Point, Union, South Dakota. Name Variation Johan Olsen Jamtgaard was also known as John. Johan Olsen Jamtgaard was born on 30 June 1849 at Orkedahlen, Sor Trondelag, Norway. He was the son of Ole Jamtgaard and Sigrid Lium. Johan Olsen Jamtgaard married Olava Quall, daughter of Lars Olsen Quall and Anne (? ), in 1872 at Ishpeming, Michigan. Johan Olsen Jamtgaard died on 29 July 1935 at age 86. Johan Olsen Jamtgaard was a farmer. He immigrated on 10 June 1871 to Ishpeming, Michigan. He migrated in 1874 at 10 miles south of Alcester, Union, South Dakota. [S246] U.S. Federal Census 1880 U.S. Federal Census, by Ancestry.com, NA Film Number T9-0115. Page 410B. ED6. Dwelling 16. [S245] U.S. Federal Census 1900 U.S. Federal Census, by Ancestry.com, ED334. Dwelling 55. Sheet 3B. [S244] U.S. Federal Census 1910 U.S. Federal Census, by Ancestry.com, ED424. Dwelling 79. [S243] U.S. Federal Census 1920 U.S. Federal Census, by Ancestry.com, ED245. Sheet 2A. Dwelling 68. Stamp 208. [S250] U.S. Federal Census 1930 U.S. Federal Census, by Ancestry.com, ED64-5. Dwelling 3. Name Variation Olava Quall was also known as Oliva. Name Variation Olava Quall was also known as Kvalle. Name Variation Olava Quall was also known as Kvaalesmo. Name Variation Olava Quall was also known as Qvaale. Name Variation Olava Quall was also known as Lava. Married Name 1872 As of 1872,her married name was Jamtgaard. Olava Quall was born on 10 February 1853 at near Trondhjem, Sor Trondelag, Norway. She was the daughter of Lars Olsen Quall and Anne (?). Olava Quall married Johan Olsen Jamtgaard, son of Ole Jamtgaard and Sigrid Lium, in 1872 at Ishpeming, Michigan. Olava Quall died on 20 June 1930 at age 77. Olava Quall immigrated in 1872. She migrated in 1874 at 10 miles south of Alcester, Union, South Dakota. 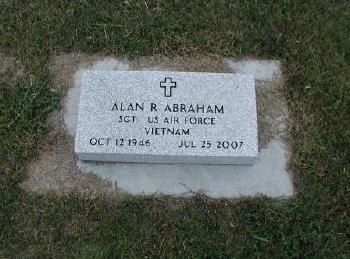 Alan R. Abraham was born on 12 October 1946 at Iowa. He was the son of Russell Lester Abraham. Alan R. Abraham died on 25 July 2007 at South Dakota at age 60 Alan Abraham, age 60 of Beresford, South Dakota died Wednesday, July 25, 2007 of natural causes at his home. Funeral services will be held at 10:00 a.m. Saturday, July 28, 2007 at Wass Funeral Home in Beresford. Visitation will be Friday from 6:30-8:00 p.m. at Wass Funeral Home in Beresford with the family present from 7:00-8:00 p.m. Alan was born October 12, 1946 to Russell and Evelyn (Simonson) Abraham in Akron, Iowa. He grew up in the Spink area and attended North Spink grade school and Alcester High School, graduating in 1964. Alan served in the US Air Force and was in Vietnam. Following his honorable discharge he returned to South Dakota and worked a variety of jobs. Grateful for sharing his life is his mother, Evelyn Abraham of Garretson, SD; sister, Karen (Steve) Bonte of Garretson, SD; brother, Jeff Abraham of Moore, OK; daughter, Kim Dimmic, two grandchildren and numerous nieces and nephews. Alan R. Abraham was confirmed circa 1960. Name Variation Charles Kempston was also known as Charley. Charles Kempston was born on 16 August 1879 at England. He married Marie (?) circa 1903. Charles Kempston married Hazel (?) circa 1927. Charles Kempston immigrated in 1894. [S184] Beresford Republic Newspaper, Vol. 57, 1950 Apr 20. [S244] U.S. Federal Census 1910 U.S. Federal Census, by Ancestry.com, ED272. Dwelling 161. Married Name circa 1903 As of circa 1903,her married name was Kempston. Marie (?) was born circa 1884 at Illinois. She married Charles Kempston circa 1903. Marie (?) died before 1927. Gladys M. Kempston was born circa July 1909 at Iowa. Clifford C. Kempston was born on 24 February 1908 at Iowa. He was the son of Charles Kempston and Marie (?). Clifford C. Kempston obtained US Social Security Card at Kansas; last residence Lincoln, Lancaster, Nebraska. [S184] Beresford Republic Newspaper, Vol. 86-87, 1980 Feb 14. [S250] U.S. Federal Census 1930 U.S. Federal Census, by Ancestry.com, ED35-13. Page 20A. Name Variation Lucille Kempston was also known as Francis. Married Name before 1924 As of before 1924,her married name was Sederman. Married Name after May 1930 As of after May 1930,her married name was Willey. Lucille Kempston was born on 6 May 1906 at Iowa. Lucille Kempston married (?) Sederman before 1924. Lucille Kempston and (?) Sederman were divorced before 1930. [S184] Beresford Republic Newspaper, Vol. 61, 1954 Jul 29. Violet Johana Kempston was born circa 1905 at Iowa. Olina Jamtgaard was never married. She was born on 9 October 1879 at Dakota Territory. She was the daughter of Johan Olsen Jamtgaard and Olava Quall. Olina Jamtgaard died on 12 August 1956 at age 76. Name Variation Carrie Jamtgaard was also known as Karen. Married Name 15 October 1902 As of 15 October 1902,her married name was Buum. Carrie Jamtgaard was born on 6 August 1882 at South Dakota. Carrie Jamtgaard married Martin J. Buum, son of John R. Buum Jr. and Gertrude Quall, on 15 October 1902. Carrie Jamtgaard died in 1955 at Union, South Dakota. Carrie Jamtgaard had 5 with 3 living in 1910 children. [S244] U.S. Federal Census 1910 U.S. Federal Census, by Ancestry.com, ED431. Stamp 287. Dwelling 128. [S243] U.S. Federal Census 1920 U.S. Federal Census, by Ancestry.com, Year: 1920;Census Place: Emmet, Union, South Dakota; Roll T625_1724; Page: 1B; Enumeration District: 250; Image: 506. 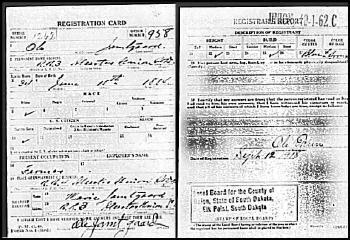 Ole Jamtgaard was born on 15 June 1884 at South Dakota based on 1900 census and WWI draft registration card; also reported as 15 Jul 1885. He was the son of Johan Olsen Jamtgaard and Olava Quall. Ole Jamtgaard married Marie Rambrant on 10 January 1906 at Union, South Dakota. Ole Jamtgaard died before December 1969. [S244] U.S. Federal Census 1910 U.S. Federal Census, by Ancestry.com, ED431. Dwelling 2. [S243] U.S. Federal Census 1920 U.S. Federal Census, by Ancestry.com, ED250. Dwelling 6. [S250] U.S. Federal Census 1930 U.S. Federal Census, by Ancestry.com, ED64-10. Dwelling 50.